Coll. No. 1421, 10 Jun 2016, characters observed: Perennial, to 12 cm., sparse multicellular hairs with clear crosswalls to 0.8 mm., plus very small (<0.1 mm.) peg-like glands, throughout; Leaves, basal, petiole 45 mm. + blade 65 mm. × 5 mm. wide, narrowly oblanceolate, cauline, reduced in size, #4-5, sessile, 15 mm. × 2.1 mm. wide, oblanceolate; Inflorescence, scapose, 21 cm. ; Heads, mostly borne singly; Involucre, 5 mm. × 11 mm. wide; Phyllaries, subequal, in 2 rows, 5 mm. × 0.7 mm. wide, margins not ciliate, tip acuminate; Flowers of 2 kinds, Ray flowers, fertile, corolla, 11 mm. × 1.6 mm. wide, ±white, fading blue; Disk flowers, corolla, 4.0 mm., yellow, lobes triangular, style branch appendages triangular; Pappus, short (0.3 mm.) and long (2.2 mm.) capillary bristles; Cypsela, 1.5-1.6 mm. Field Notes: Coll. No. 1421, 10 Jun 2016. 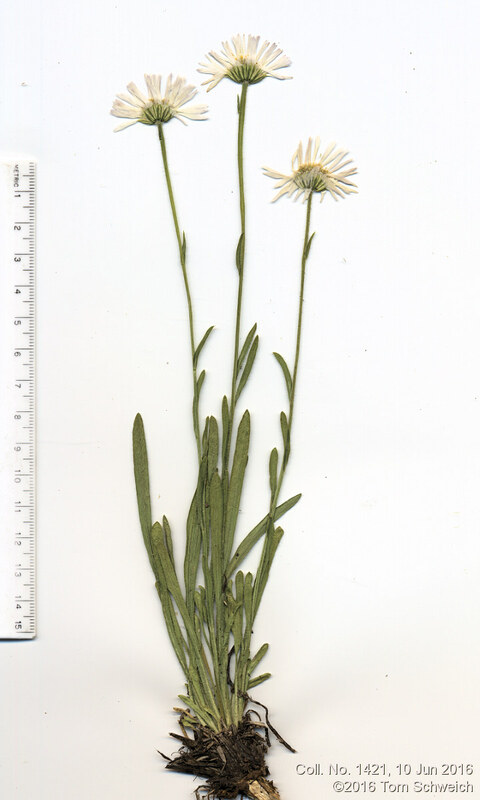 Other photos about Species - Asteraceae or Erigeron vetensis.